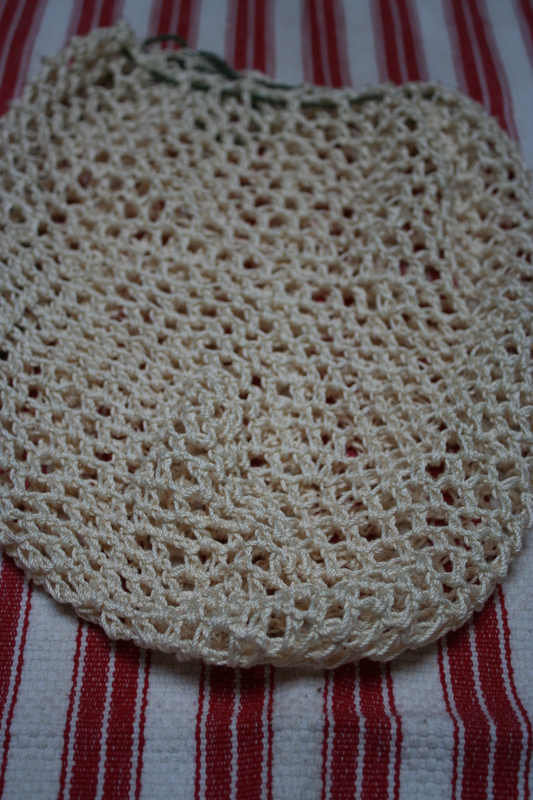 In my quest to try to rid our lives of plastic (at least starting with plastic bags) I have started to crochet produce bags. Now I won’t say this is the quickest thing – but I am enjoying making these. We have s0 many cloth bags for shopping but I always end up with plastic bags from our produce and it drives me crazy. I was inspired by Farmama and her one small change. She sewed up a bunch of bags for their bulk foods (this is my next step). 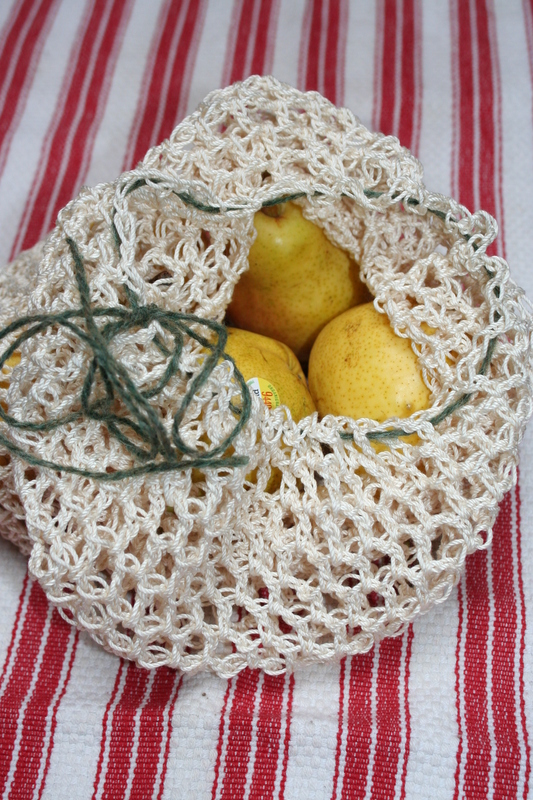 You don’t even need to know how to sew, I just saw some produce bags for sale at Whole Foods the other day (for not that much) but of course that would be too easy for me 😉 But seriously, you can buy cloth bags and produce bags for a nominal fee and have them for ever. Luckily summer is coming and I hope to be harvesting most of our produce from our yard, but of course you can’t pass up the farmers market to see what goodies they’ve got. So my little bags will come in handy. I’ve been buying in bulk much more (grains, nuts, dried fruit, etc), but now I have to work on reducing the other plastic packaging. It’s everywhere, the bag of pretzels you purchase, the block of cheese, etc. It’s crazy! Well, this is my next step I’m taking. We’ll see where this leads us (what will be our next step)? What will your small step be? Do you keep your cloth bag supply in all your vehicles so you always have them? If not, make that your small step. Keep a few cloth bags in each car and a couple in your house, so you always have them available. A couple weeks ago I was laying on the couch, feeling miserable and sick, Doug had taken the kids out for the day and I get a phone call. It’s Doug, he’s at the thrift store down the street from our house and he has found an old kitchen hutch, with no back or shelves and needing some TLC but it was a great price and he thought we could restore it and try to sell it (and maybe make a little bit of money – imagine that). I didn’t feel like thinking about it so I just said “sure” bring it home and we’ll figure it out. So he loads this thing in the truck and brings it home. I finally drag my bum off the couch and peak out the window to see what we have gotten ourselves into……. it’s huge! Holy smokes – this thing looks like it’s been sitting in someone’s barn for the last 30 years! This is going to require some work. But as I get closer and I see the adorable (and original) green glass knobs, the wavy glass in the top cabinets ( I love old glass and mirrors – the wavy look of the glass or the darker look of the mirror – it just screams vintage) and the three dowels on the side for towels – I quickly fall in love! Fabulous eye Doug! But it just looks so big there is no way we could keep it. Our house is, well let’s say quaint, and we already have a lot of antiques we have restored and they all have their “spot” and I don’t want the house to feel crowded. We rope our neighbor into helping us bring it into the backyard to store it until we can start cleaning it up and restoring it. So there it sits, and there I sit in the sun porch eyeing it. I think it was on Tuesday morning when I finally went out there and started measuring it up, then I went inside and started measuring the wall in the kitchen that it would look GREAT on. According to my measurements it would fit perfectly, except there is already a beautiful antique buffet on that wall. Hmmm, so I start measuring up different spots to start moving pieces of furniture. Well, after about 30 minutes of measuring and checking and re-measuring I decide – that’s it we are keeping it and moving furniture around so it can fit in the kitchen. So begins the process of cleaning and restoring. It actually wasn’t bad since we were just going to paint it white and then add the shelves and the beadboard backing. It’s a lot more work if you have to strip the layers of paint, sand and then stain. So after two weekends of TLC we moved it into it’s home and now have a place for my grandmother and Doug’s grandmothers China (which have been sitting in our garage for almost a year). Oh, I’m so happy with this restoration. It just feels so good to give life to something that was going to be discarded and keep it alive. Things aren’t made as good as they used to and I love knowing there is history with this piece of furniture. Again, we’ve saved something else from meeting it’s demise at the landfill. pants or a shirt – you decide? So I have been collecting Doug’s old shirts and mine – that have fun patterns or good pockets. You ask why? Well, I have been saving them to make pants for the kids. Soulemama has a technique she wrote about in her book The Creative Family. I thought – what a great idea! I love to re purpose something and give it new life. So I busted into my collection and began my project. Amazingly it is super quick. I think in total it may have taken 15 to 20 minutes – not too bad and in the end you get a cool new pair of pants. Here’s how it goes….. take your shirt, lay out a pair of pants that is the kids current size, trace around it (I actually just cut with the pant laying on the shirt – another way to save a step). Add a little around the pant to allow for seam allowance, cut a piece of elastic to size, sew it up and you got yourself a new pair of pants. You can read in detail in her book. I place the pants so that the pocket of the shirt becomes the back pocket of the pants. I recently made Ryder a pair out of an old Ben Davis shirt of Doug’s (they are adorable) and also a pair of linen pants out of an old linen shirt (perfect for spring/summer). My shirts don’t work so well b/c of pleating (something to watch for). I have some jersey shirts I will be using for shorts and leggings. I did make a skirt out of an old shirt of mine for Saige – it’s now one of my favorite skirts for her. I love to see the little ones in their handmade garb – and they seem to like it too! Nothing better than when your 4 1/2 year old says “mama, will you make me another pair of pants”. I just LOVE it!!!! Crafting with kids doesn’t have to be extravagent or require a lot of supplies, it can be as simple as glue, magazines and construction paper. I’d have to say most of us have magazines/old books and glue on hand, the construction paper might not be a staple in some homes, but it’s easy to find at the store and it might be something you want to keep on hand (you can do so much with construction paper). Anyways, with these three supplies you can do so many projects. Two projects that we’ve come to enjoy and I remember doing when I was little (and still have fun doing today) are collages and paper chains. I have stacks of magazines that we go through and cut pictures out of (all kids love cutting) and if you aren’t sure about letting your little ones use scissors you can tear the pictures out (which I kinda like the torn edges when I’m making a collage). I will either have Ryder just pick out whatever images he wants or sometimes we’ll come up with a theme, like animals, and we’ll find all the pictures of animals and then some elmers glue and contstruction paper and you’re done. You can find kids books at garage sales or thrift stores for $0.25 and these are great for finding pictures for collages. I’ve found that I’m enjoying making collages for myself. I use it as inspiration. I recently made a spring collage and it gives me inspiration on a rainy day or when I’m sewing. Great to pull colors from or patterns. The second use for the construction paper and glue is paper chains. I’m sure you all remember making those in grammer school. I love them. They are so colorful and fun to hang in the kids room. Just an added splash of color. We just made a “spring” chain with springy/easter colors. So we’ll keep that up while we wait for springs arrival.